Reducing greenhouse gas emissions is a formidable challenge for Canada’s freight transportation sector. If we are serious about doing our share to constrain climate change to less than 2oC by 2050, it is a challenge that we must meet. The country’s freight systems contribute 69 million tonnes of carbon equivalents spread across rail, road and marine modes, representing nine per cent of Canada’s total GHG emissions.1 However, these systems are tightly linked to our prosperity and livelihood. Freight transportation is an essential conduit for our economy. There are currently very few viable low-carbon options available to the heavy freight sector that can meet the performance needs of the modern supply chain and keep our nation competitive in the global marketplace. The supply chain dynamic has definitely changed in the past few decades, with deregulation, free trade, containerization and just-in-time delivery all contributing to growth in transportation demand. 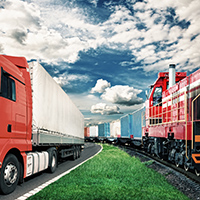 Both rail and truck transportation modes responded equally to absorb the growing demand. Railways consume up to nine times less energy per tonne kilometer travelled than trucks.2 Converting a greater share of freight to low energy intensity modes of transport is an opportunity for Canada to reduce GHG emissions. Policy can shift freight to railby encouraging competition, infrastructure investment and charging all modes of transport proportionately for externalities such as carbon emissions. However, shifting more freight to rail is not a panacea. Shifting more freight to move by rail will achieve substantial GHG emissions reductions in freight transport. But by using only this strategy, the gap from the 2050 reduction target still remains enormous (see Figure 1). Canada has made little overall progress in improving the energy intensity of its freight systems, but it is not entirely for lack of effort. Improvements have been made in engine and non-engine technologies, such turbo charging and aerodynamics. Progress has also been made with enhanced logistics, information and communication technology, and with carrier and shipper best practice sharing using Natural Resources Canada’s SmartWay programs. Unfortunately, these efficiency gains have been offset by the operational demands of just-in-time delivery, which put more value on meeting delivery schedules than maximizing load capacity. Efficiency gains were further set back by criteria air pollution standards that sacrificed energy efficiency for abating harmful sulfur and nitrogen oxide emissions. Railways have been more successful than trucking at achieving reductions in their already very low energy intensity. But the fragmented trucking industry in North America has been plagued with cultural and economic barriers that thwart adoption of new energy-efficient technology. The federal government recently has directed the trucking industry towards fuel-efficient engine and vehicle technology, with its Heavy-Duty Vehicle and Engine GHG Emissions Regulations and impending aggressive Phase 2 standards starting as soon as 2018. Both phases of these regulations are anticipated to drive a combined 33-per-cent improvement in fuel efficiency.3 Should the new Phase 2 standards not be successfully implemented, the Reference Scenario GHG emissions would be 19 per cent higher than if only the current standards are adopted into new engine and vehicle technology (Figure 2). Even with the aggressive policy, the Reference Scenario will not achieve the Canadian commitment. Improving fuel efficiency with eco-driver training and the use of platooning technology should also help reduce GHG emissions, especially when paired with improved capacity utilization improvements and a reduced travel with empty trucks. Scenario modeling shows that significant GHG reductions of 18 per cent to 26 per cent can be achieved with these technology and behavioral changes. However, with increases in transportation demand considered, emissions in 2050 are still projected to be greater than that in 2005, the year used to define Canada’s 2030 and 2050 climate change commitments. Let’s give it all we got! Freight transportation is an extraordinarily complex system and there is not a straight path to a climate change solution. So what if we used everything we have in our tool box? By making dramatic shifts to rail and applying fuel-efficient practices to the trucking sector, Canada can reduce its freight transport GHG emissions below 2005 levels by 2050 (Figure 3). Nevertheless, Canada’s freight sector will not be able to reduce its GHG emissions by 30 per cent of 2005 levels by 2030, let alone achieve an 80 per cent reduction by 2050 by relying on mode share shifts and fuel efficiency of diesel engines. The challenge of reducing GHG emissions still lies very much ahead for the freight transport industry. Canada will need to remain committed to making the best use of its transportation systems as well as to fuel efficiency. But it is also critical that we take these initiatives one step further. We need to invest in developing alternative engines and/or fuels that are operationally fit for heavy freight transport and that will align with Canada’s climate goals. Biodiesel has long been touted as a possible drop-in fuel, but concerns about costs and the sustainable supply of biomass feedstock have fueled the search for alternatives. Exciting progress has been made in hydrogen fuel cell and battery-powered class 7 and 8 trucks. This was previously thought to be out of reach for heavy-duty trucks, but with recent announcements of hydrogen fuel cell-electric trucks by Nikola Motors, Toyota, and Ballard/Kenworth, and fully battery electric semi-trucks by Tesla, Daimler and Cummins, the electric truck is no longer just a pipe dream. As part of the Canadian Energy Systems Analysis Research (CESAR) Pathways Project, CESAR’s researchers will be exploring electrification of the freight industry and investigating the potential disruption of autonomous trucking and associated GHG impacts. The CESAR Pathways Project is defining credible, compelling and cost-effective pathways to future energy systems that will make it possible for Canada to meet its 2030 and 2050 climate commitments. CESAR’s unique, value-added approach uses narratives as a foundation to align climate objectives with other societal goals for systems change. Biological Solutions. Optimizing land/resource use for food, fibre, energy and enhanced carbon stocks. 1 Environment and Climate Change Canada, "National Inventory Report 1990-2014: Greenhouse Gas Sources and Sinks in Canada," 2016. 2 Lof, Jessica, 2017. "A Reduction in Canada's Freight Transportation GHG Emissions by 2030 and 2050: A Scenario Analysis," MSc SEDV Thesis (University of Calgary).